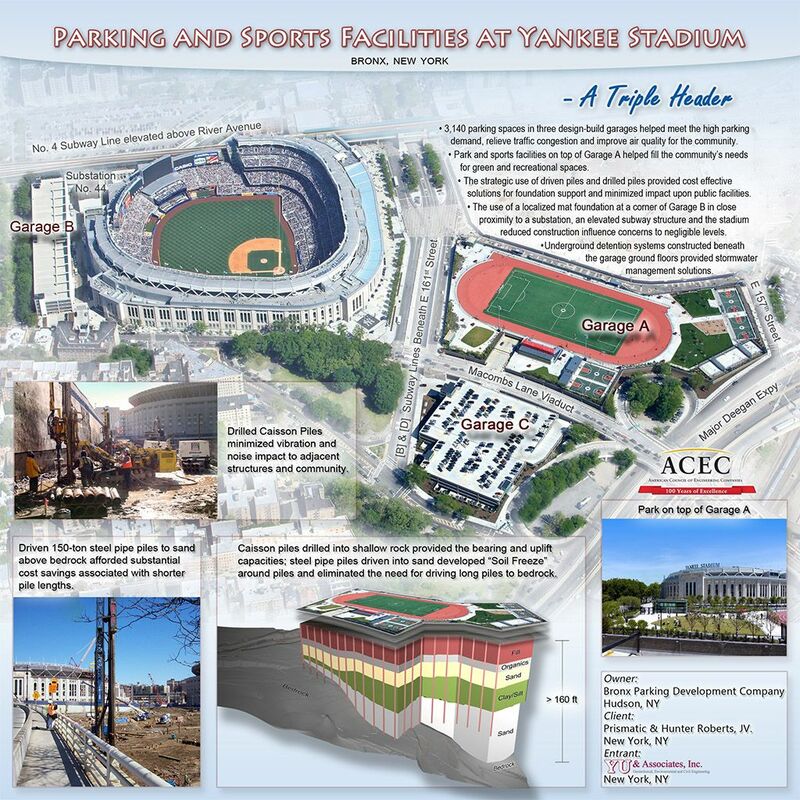 The American Council of Engineering Companies presented YU & Associates, Inc. of New York with a 2011 ACEC Award for Engineering Excellence in recognition of its unique and innovative subsurface engineering solutions to complex engineering challenges related to the design and construction of the Parking and Sports Facilities at Yankee Stadium. The successful application of “soil freeze” - a gain in pile capacity with time – in foundation piles driving to sand for this project has added confidence for geotechnical engineers to use this design concept for future projects. This innovative application can prevent the unnecessary waste of materials and allow for substantial cost savings in construction. The use of multiple foundation types to avoid adverse impact on adjacent facilities and the community during construction in a densely populated urban environment promoted a positive effect on how the work was received by the neighborhood and stakeholders. As a commitment to the community, three independent parking garages (Garages A, B and C) were built to meet the high parking demand, relieve traffic congestion, and improve air quality at the new Yankee Stadium. The three parking garages - one 3-level, one 5-level and one 4-level - have added over 3,100 parking spaces to the neighborhood. A park and sports facility was constructed on the roof level of Garage A to meet the community’s need for a park and playing fields. YU & Associates (YU), a member of the Design-Build team, was the Engineer-of-Record for the project in the disciplines of Geotechnical, Civil and Environmental Engineering. As the Geotechnical and Civil Engineer-of-Record, YU faced different engineering challenges such as: 1) the proximity of existing infrastructures including a) multiple subway lines both elevated and below grade and an associated substation, b) a busy vehicular viaduct, and c) major underground utilities; 2) variable and complex subsurface conditions with a sloping bedrock; 3) concerns regarding adverse impact upon the nearby public facilities; 4) aggressive construction schedule and complex logistics tied closely to the opening of the new stadium; and 5) stringent requirements for stormwater management. YU confronted these challenges by developing innovative and cost-effective engineering solutions to help deliver the project on time and within budget. These solutions included: 1) the strategic use of multiple types of pile to provide cost-effective solutions for foundation support and to minimize impact upon nearby public facilities; 2) the unique application of “soil freeze” concept to develop high bearing capacity in sand without the need for driving very long piles to the sloping bedrock; 3) the use of drilled piles to provide the required bearing and uplift capacities in shallow rock areas and to minimize vibration and noise impact to adjacent structures and surrounding community; 4) the use of a localized mat foundation in lieu of drilled piles in close proximity to adjacent sensitive structures to reduce construction influence concerns to negligible levels; and 5) the design of an underground detention system beneath the garage floor for stormwater management. Through the investigation, design and monitoring work performed by YU, the project was perceived by the public as safe, environmentally conscious, and well-organized throughout construction. The completed project has relieved the traffic congestion in the neighborhood resulting from any event held at the Stadium. The air quality in the community has been improved through the significant reduction of vehicles circling the streets in search of parking spaces.. The new facilities have also made the streets safer for residents in the area by reducing the amount of vehicular traffic passing through pedestrian areas. As part of the new Yankee Stadium Development, three parking garage structures with roof-top parkland facilities were constructed as a design-build project. YU & Associates (YU) as a design team member was responsible for delivering all site/civil, geotechnical and environmental engineering services for these parking structures. These structures now provide more than 3,700 car parking spaces and roof-top sport/park facilities with track and field grandstand seats, a softball field, multiple basketball courts, and multiple handball courts. Geotechnical and construction support services were performed for a subsurface investigation, foundation evaluation, and construction oversight. These presence of variable subsurface conditions and proximity to below grade and elevated subway structures required the planning and implementation of multiple types of pile foundations. Planned construction phasing, controlled inspections of earthwork, pile load test and installation were performed by YU for the duration of the project. Environmental engineering services included site investigation, contaminated soil delineation and reporting. During construction, environmental site monitoring and soil disposal management work were performed. These included community air monitoring, waste classification and reuse and disposal facility evaluations as well as agency coordination. HazMat services involved asbestos and lead paint (ACM & LBP) investigation and abatement design. Site Engineering included the site layout and grading design, utility connections and stormwater management designs, and regulatory permitting. Site engineering work also involved builder’s paving plans, a master sewer plan and the relocation of an existing major sewer.